Love is a part of our everyday language… I love chai tea, I love these jeans, I love to read, I love that boutique, I love that song… we all have the capacity to love, its built into our DNA. It is really easy to love “things” and sometimes, a little harder to love people. There are so many passages in the Bible that talk about loving others*. Jesus spent his entire life on earth loving people no matter their mistakes, lifestyle, social status, or appearance. Here are some ways Jesus modeled love for everyone. 1. He gave value to women even though it went against cultural standards. He healed Simon’s Mama in Mark 1:30-31. He showed compassion to a widow who had lost her only son in Luke 7:11-15. He honors a woman’s faith after healing her in Luke 8:43-48. We all know how he gave Mary a spiritual high five by praising her desire to learn in Luke 10:38-42. 2. Children were given value and set as an example to all of us to have a child-like faith, like in Mark 10:13-16. 3. Jesus came for everyone to give freedom, share the good news, and heal the sick as we see in Luke 4:18-19. Jesus would show value to others by listening wholeheartedly. His attention wasn’t divided when someone was speaking to him, he was fully present. Whether you were coming at him with love or hate, he listened and offered a thoughtful reply. We see Jesus’ encouraging words to his disciples. He tells them to have courage (John 16:33), he prays for them (Luke 22:32), he says not to worry (Matthew 6:25 & 34), and he comforts them during a very stressful time in his own life (John 14:1). Jesus was exquisitely good at helping others with his power, kindness, grace, mercy, fairness and strength. He had a beautiful way of bringing people together in unity. I’m thinking of that awesome moment where he is on a mountain with his crew and a giant crowd begins to approach him. Jesus is the ultimate host here and wants to give them food and before you know it, over 5000 people are eating fish and bread (John 6:1-14). Or, what about the time Jesus washes his disciples feet (John 13), I mean, that is super helpful after a long day of walking and talking. There is a bigger lesson in that story, but its the little things, folks. To love others well, we need to show respect without prejudice, listen wholeheartedly, encourage abundantly, and serve others in humility. How can you begin to love others better? PERSONAL APPLICATION: Begin each day asking God to show you one person that you can love well during the day. Ask God for unique opportunities where you can show respect, listen carefully, encourage someone, or serve without acknowledgement. 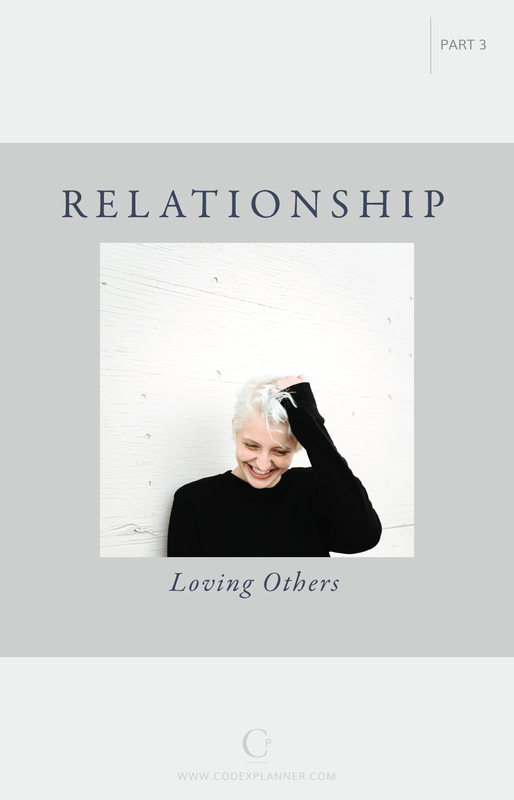 There are bonus worksheets available to go a little deeper into a Biblical perspective of relationships. The worksheets will provide you with practical applications, challenges, and content.